Teach Indy has helpfully posted a professional development video that overviews the Common Core State Standards, the instructional shifts, and several PARCC performance tasks here. 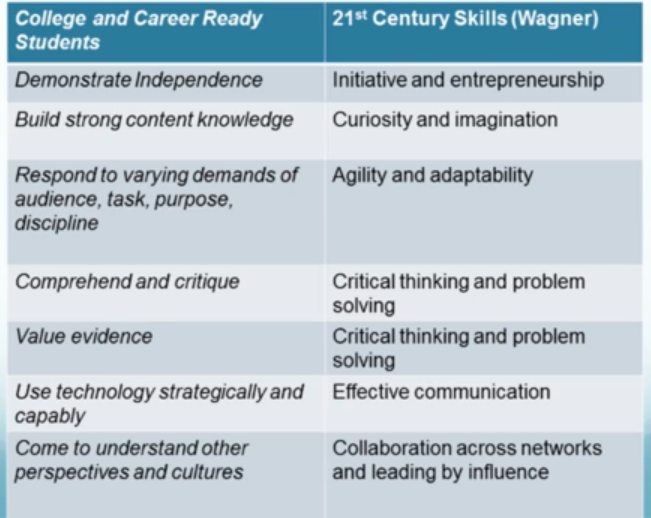 In addition to the aforementioned, the presenters in the video make explicit connections between Tony Wagner’s research on 21st Century Learning and the front matter in the Core standards documents (image below) at minute 11:10. This entry was posted in Common Core State Standards, Instructional Shifts and tagged 21st Century Learning, CCSS, Common Core State Standards, communication, imagination, PARCC, performance tasks, Tony Wagner. Bookmark the permalink.